The Illinois Labor History Society hosts monthly guided tours of Forest Home Cemetery from May through October. Visit the Memorial to the Haymarket Martyrs, the resting place of Emma Goldman, Lucy Parsons, Elizabeth Gurley Flynn, and more. Tours will be held the first Saturday of the month, from May - October. Tour begins at 11am, rain or shine. Suggested donations $10. Senior Citizens $5. Consider bringing a folding chair, an umbrella and camera! For schools, churches or other large groups, please call to reserve space 312-341-2247 or email us. When we started Weave News back in 2007, we started from a basic conviction: there is a need for more independent media outlets to tell the stories that too often go ignored underreported by the establishment media. Stories related to workers’ struggles regularly fall into this category, with contemporary reporting patterns mirroring the much older process of pushing these struggles to the margins of public narratives in general. A classic example that continues to resonate outward from the city of Chicago, with implications for workers across the world, is the 1886 Haymarket Affair. While attending the recent Union for Democratic Communications conference in Chicago, I had the chance to take part in a labor history walking tour that highlighted the legacy of this important, yet poorly understood moment in American history. Led by longtime American Federation of State, County, and Municipal Employees (AFSCME) organizer and current President of the Illinois Labor History Society (ILHS) Larry Spivack, the tour began at the old Criminal Courts Building, near the corner of Hubbard and Dearborn. About 30 conference attendees listened closely as Spivack explained to us the context surrounding the events that led to the “kangaroo court” trial of the group that came to be known as the Haymarket Eight and the eventual hanging of four of them. As we wound our way through the neighborhood, Spivack continued to offer more historical detail on the intense period that he described as “a conspiracy of the wealthy to end the labor movement,” including the obscene wealth and power amassed by the Pullman Company and other titans of the Gilded Age; the politics surrounding the struggle for the eight-hour work day; and the role of unsung (and sometimes unnamed) activists, often women, who helped push the workers’ resistance forward. He spoke about the suppression and distortion of key elements of the Haymarket story in school textbooks and elsewhere, as well as the efforts of the ILHS to keep the story alive today. 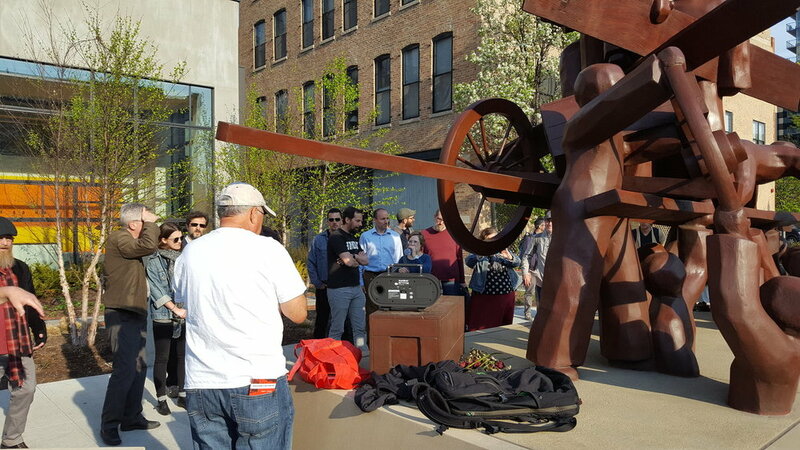 The tour ended at the Haymarket Memorial, a bronze monument created in 2004 by Chicago artist Mary Brogger with the blessing of the city of Chicago. Embodying the tradition of Albert Parsons and Samuel Fielden, who spoke at the original 1886 Haymarket Square rally a day after the killing of picketing workers by police at the McCormick Reaper Plant, Spivack stood on a “soapbox” and spoke passionately about the internationalist character of the monument. He noted that since 2004 several plaques from labor federations in numerous countries from Canada to Turkey to the Philippines have been added to Brogger’s monument along with one from the World Federation of Trade Unions.